Top 5 Reasons Parents are seeking Pediatric Chiropractic! Yep, you read that right! 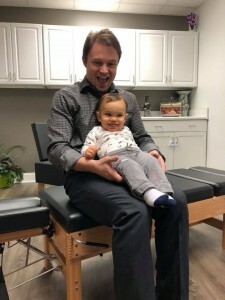 Chiropractic is for the littlest members of the family too! Chiropractors with advanced pediatric training are perfect for helping with many of the challenges your child may face during the vital growth and developmental years. Here are a few of the most common conditions parents ask us about and how we can help. Crying is a normal occurrence with a newborn child, especially within the first few months of being born. It is their communication for when they are hungry, tired, wet, or uncomfortable. But what happens when your child cries constantly? How do you know if they are okay or if they are trying to tell you something? Colic can be very exhausting for both the child and parents who all end up sleep deprived and irritable. Pediatric chiropractors across the globe are seeing this upward trend in infant conditions like colic. Very commonly the child is uncomfortable from trauma they sustained during the birth process, which can include gut issues. A properly trained pediatric chiropractor can find these areas of disturbance and correct them, so everyone can get some sleep! This also sets the child up for the best growth and development possible. Today’s chiropractic adjustments are safe and natural, especially for infants. Through multiple trainings performed weekly, our doctors stay dedicated to the latest research, technology, and techniques to best care for every child of all ages. Fall will be here in a few months and for parents of kids who get chronic ear infections this can be a dreaded time of year. Changes in routine, eating habits, sun exposure and stress levels all combine into a recipe for disaster. The ear is a very complex and important structure to protect. Let’s keep it simple and focus on the mechanism that allows the ear to drain properly. In the normal resting state, the Eustachian tubes are flat tubes that lay “closed.” There’s a muscle in the ear attached to the Eustachian tube called the tensor veli palatini. The end of this muscle attaches to structures deep within your head and neck. This important muscle’s job is to flex and open the tube to allow it to drain down into the back of the throat. What happens when this muscle is asleep on the job and doesn’t properly open the tube? The backup of fluid in a warm moist place is a breeding ground for bacteria and viruses. How can a pediatric chiropractor help? They make sure nothing is blocking the body from communicating with the tensor veli palatini so that it can function properly and regularly drain the ears. Imagine everyone around you has thick scarves tied over their mouths and when they speak it is jumbled and muffled. This is what it feels like inside the brain of a child with sensory processing issues. The communication between their brain and body is muffled and jumbled making it much more difficult to understand and interact with their environment. The key elements to understand here are PERCEPTION and COORDINATION. Without proper perception, there cannot be proper (normal) coordination. Kids who suffer from Sensory Processing issues have an inability to properly perceive their environment and therefore, struggle trying to coordinate their responses. Your spine acts as a communication super highway between your brain and body. Imagine if the interstate was only one lane, made of gravel and full of pot holes. It would be tricky to get around, and you would constantly need to get your vehicle aligned and maintained. A pediatric chiropractor helps here by working to smooth out, pave and widen the communication interstate, so vital information can arrive at its location on time, in order and unscrambled. Think about a time when you were at a live concert. The music was LOUD, lights flashing, it was crowded, and talking to your neighbor included shouting even though you were inches from them. This is what it feels like to be inside the brain of a hyperactive child. They are constantly overwhelmed with too many signals making it very loud and therefore difficult to concentrate. Imagine trying to take a test at that concert, you probably would not do very well. A pediatric chiropractor helps them by calming down the nervous system to allow less overwhelm and effective communication to take place within the child’s body. There are a ton of stereotypes around pregnancy and the things you are going to feel and going through while pregnant. What if I told you back pain, sciatica, heart burn, carpal tunnel, headaches and round ligament pain are things you do NOT have to suffer with while pregnant? Our bodies go through an incredible transformation during and after pregnancy. Prenatal chiropractic care can help your body adapt to these changes as they occur. Prenatal chiropractic, like all chiropractic, focuses on your nervous system which is the master controller of your body. When the master controller is doing their job right your body can adapt much more effectively and efficiently to these rapid changes. It is vital for normal fetal development that the baby has as much room as possible to move around while in-utero. Proper alignment allows the uterus to be the proper shape and size for this development. Another important consideration is the motion and alignment of the joints of your hips and pelvis. Think about making a clear path out for the baby with all the joints able to move and open properly. Women under regular chiropractic care also enjoy shorter labor times too! It is much easier to raise healthy kids than to try and “fix” broken adults! Chiropractic does not treat any specific disease, we help to create a healing environment by allowing your Nervous System (the master controller of the body) to function properly. The benefits are not just for kiddos! We love and care for people of all ages. Want to learn more? Do you need a doctor to answer your specific questions? Schedule a free 15-minute phone consultation with one of our highly trained doctors, simply call 843-203-3199.